David Wallace was born November 10, 1825 in Pitt County, North Carolina. The family was of proud Scottish heritage and there is evidence to suggest that David directly descended from John Wallace, the brother of William Wallace made famous by the film Braveheart. David’s grandfather immigrated from Scotland and fought in the American Revolution at the battle of Yorktown where he witnessed the surrender of General Cornwallis. As a boy, David was extremely intelligent and while in high school, he proved to be such an outstanding student that they made him the teacher before he graduated. David was valedictorian at Wake Forest in 1850 and obtained his medical degree from New York University in 1853. While at Wake Forest, he was active in the Wake Forest Baptist Church where their records note his “unanimously recognized gifts” in the art of preaching. He began working at a hospital in New York City and was offered the Chair of Psychology at NYU by John W. Draper but Wallace turned it down. He moved to Washington, Texas in 1856 where he opened a private practice and taught ancient languages at Baylor in Independence. As luck would have it, both Wallace and Baylor eventually moved to Waco in 1861 and the city was ever grateful for both of them. of 1865, Waco 92 Brother James Harrison was the new general over Wallace and wrote to a superior officer about him, “David Wallace is a perfect gentleman, thoroughly educated, and a scientific surgeon.” He wrote the letter in an effort to keep Wallace attached to his division. 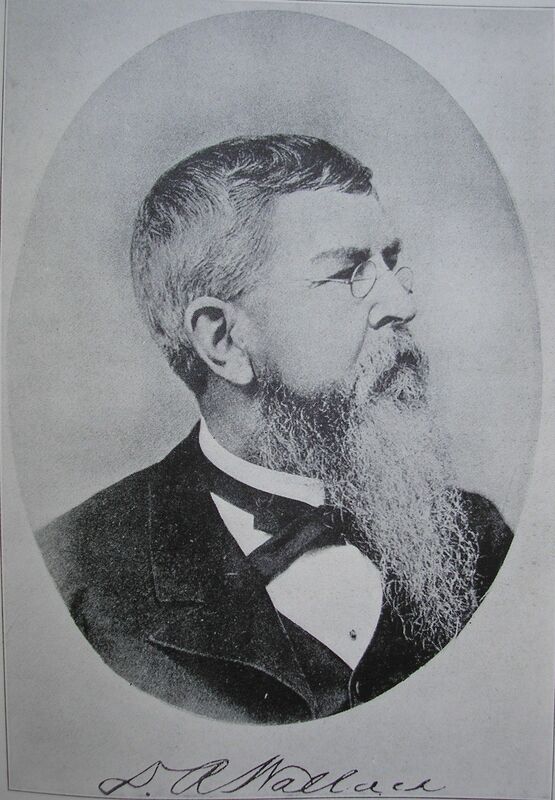 In 1872, Wallace was President of the Waco Medical Association and served in the same capacity for the Texas Medical Association, one year later. He played a significant role in the creation of both organizations. At some point prior to 1874, Wallace is supposed to have treated Empress Carlota of Mexico. 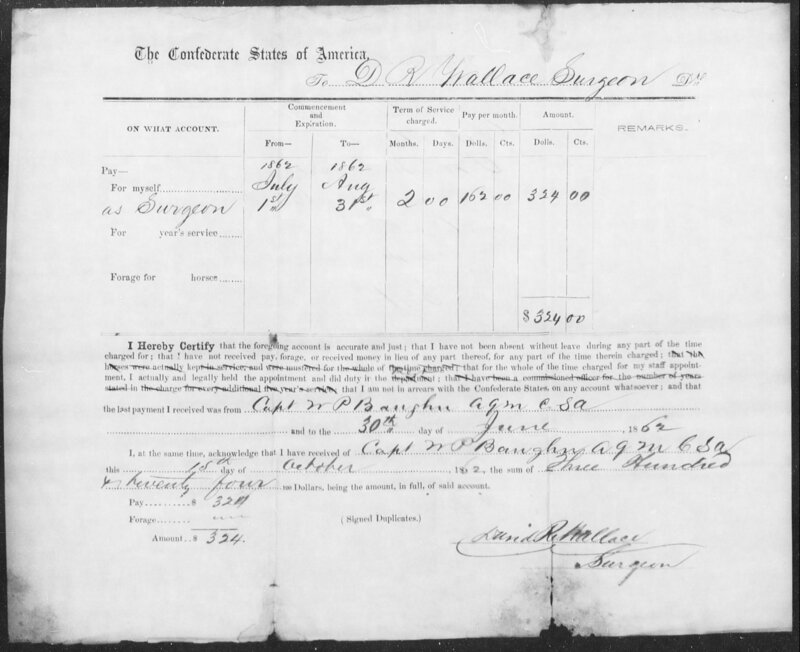 In 1874, Wallace acquired a law degree from Baylor and was appointed by Governor and Waco 92 Brother Richard Coke as Superintendent of the Texas Lunatic Asylum, the forerunner institution of today’s Austin State Hospital. He stayed on there until 1879. In 1878, Dr. Wallace gave a speech to the graduating class of Texas A&M. In 1880, he traveled home to North Carolina to do the same for his alma mater Wake Forest. From 1883-1891, he was the first Superintendent of the North Texas Hospital in Terrell and practiced medicine there until returning to Waco in late 1891. Today that hospital is known as Terrell State Hospital. By the time of his retirement from the hospital in 1896, he was considered a leading expert in the field of nervous and mental disorders. 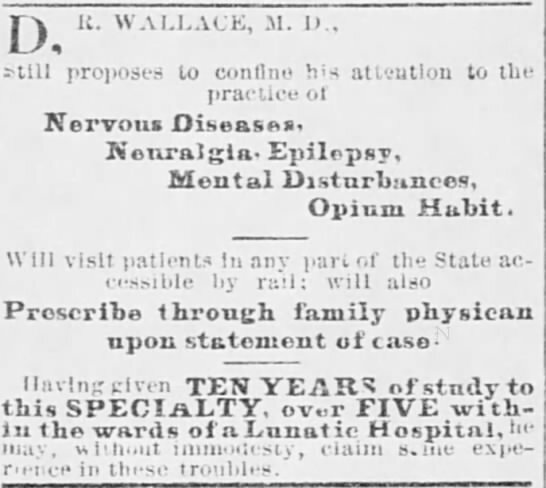 In fact, Wallace was considered the first doctor in Texas to focus entirely on psychiatric health. Wallace was very progressive in his efforts as a doctor. He advocated for freeing the mentally ill who posed no harm to others, forbid the use of restraints, and developed a system of allowing the patients temporary periods of freedom outside the hospital which proved very effective for their long-term care. “The world has been good to me, much better than I have been to it. I have never been sued, never sued anyone, and never owed a penny that I could not pay on demand. I have not and never had any enemy. My sober wishes never learned to stray. I have never been seriously ill but healthy and happy these many years. I have had all the happiness in life I could have reasonably expected. ‘If there’s another world, I’ll live in bliss. Dr. Wallace died four years later November 21, 1911 and the city of Waco mourned together. His gravestone, created by sculptor Frank Teich, is one of the most remarkable memorials in Oakwood Cemetery. It includes a statue of him looking across to the statue of his longtime friend and 92 Brother, Governor Richard Coke.